In increasingly fragmented landscapes, it is important to understand how mature forest affects adjacent secondary forest (forest influence). 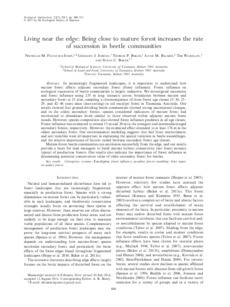 Forest influence on ecological succession of beetle communities is largely unknown. We investigated succession and forest influence using 235 m long transects across boundaries between mature and secondary forest at 15 sites, sampling a chronosequence of three forest age classes (5-10, 23-29 and 42-46 years since clearcutting) in tall eucalypt forest in Tasmania. Our results showed that ground-dwelling beetle communities showed strong successional changes, and in the oldest secondary forests, species considered indicators of mature forest had re-colonised to abundance levels similar to those observed within adjacent mature forest stands. However, species composition also showed forest influence gradients in all age classes. Forest influence was estimated to extend 13 m and 20 m in the youngest and intermediate aged secondary forests, respectively. However, the estimated effect extended to at least 176 m in the oldest secondary forest. Our environmental modelling suggests that leaf litter, microclimate and soil variables were all important in explaining the spatial variation in beetle assemblages, and the relative importance of factors varied between secondary forest age classes. Mature forest beetle communities can recolonise successfully from the edge and our results provide a basis for land managers to build mature habitat connectivity into forest mosaics typical of production forests. Our results also indicate the importance of forest influence in determining potential conservation value of older secondary forest for beetles.